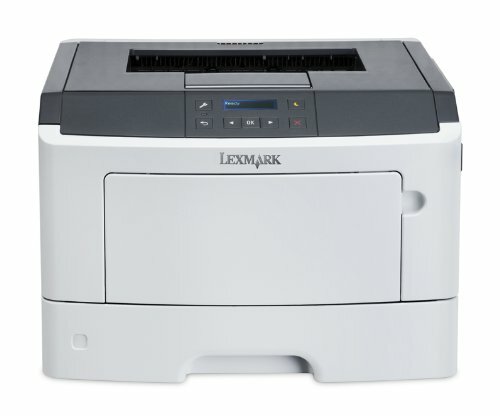 The affordable Lexmark MS317dn offers performance and features typical of higher-priced printers. With advanced security features, built-in duplex printing and networking, plus optional wireless printing and extra input capacity, the MS317dn is a great value for small and medium businesses. It prints up to 35  pages per minute, with a recommended monthly page volume of up to 2,500 pages. Unison™ toner ensures outstanding print quality throughout the life of the cartridge with an affordable acquisition price and low cost per page. Fast, quality output: print up to 35 pages per minute and save paper with integrated duplex feature. Get more out of your investment when you share this printer with other people in the office; easily print 2,500 pages per month with no hassles. Available Mobile Printing with Lexmark's free Mobile Print app; supports wireless printing with the optional Wi-Fi adapter (Part # 27X0128). Value inside the box: printer ships with 1,500-page starter cartridge and one-year warranty. Order extra toner: p/n 51B1000, 2,500 page yield. Experience minimal interruptions with optional second paper tray to raise paper input capacity from 300 to 850 sheets.